We're proud of every site we've built. A complete list of our clients' sites is provided for you to browse, and on this page we've selected sites that showcase particular features. 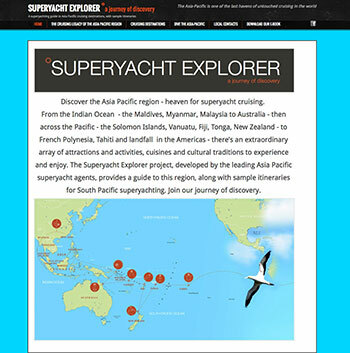 A superyacht cruising destination guide to the Asia-Pacific region with special attention to South Pacific superyachting. The printed/ebook guide was designed by @URL associate Becca Wood, and a website was developed by Albatross PR, however, that site has now been transferred from Weebly to Free Parking, with associated redevelopment of the look and some content, plus a new CMS.